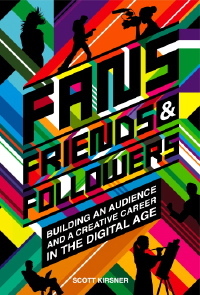 I've been slow to do this, with busy-ness as my only excuse, but I'm now making the PDF/e-book version of my 2009 book Fans, Friends & Followers: Building an Audience and a Creative Career in the Digital Age available as a free download. It's about 5 megabytes. Share it with anyone you'd like. If you find it useful, you can make a PayPal donation using the button below. Info about how to purchase the paperback or Kindle versions are here, on the book's website.